In the month of November when the super short summer in Sapporo is gone and the bone chilling winter has not started yet, came a birthday along with a long weekend. I was dying to get away from my squirrel cage. I did a quick research and found a small town in the Shikotsu-Toya National Park region Lake Toya Onsen. It is a romantic place with good choice of accommodations and also easily accessible by public transport. 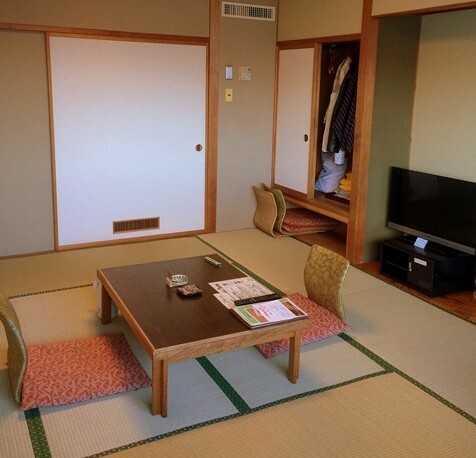 We booked a Japanese style room at the Toya Kanko Hotel through Booking.com. The room rate for two with half board (breakfast and dinner) was about ¥26,000 per night. Lake Toyako Onsen is accessible by bus or a train from Sapporo. We decided to take the train simply because I don’t enjoy holding my pee for 3 hrs 😳 . 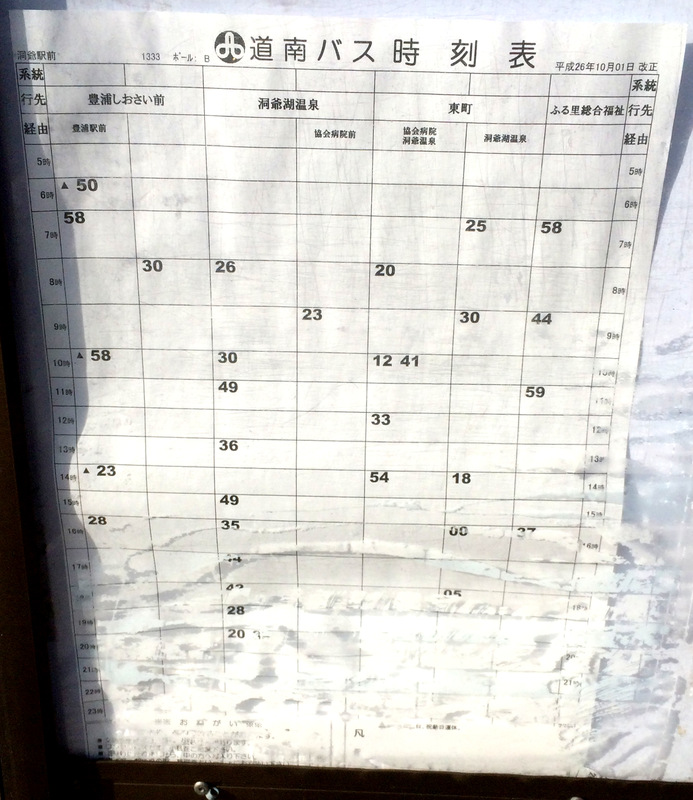 In addition, the train takes only 1.30 hrs. 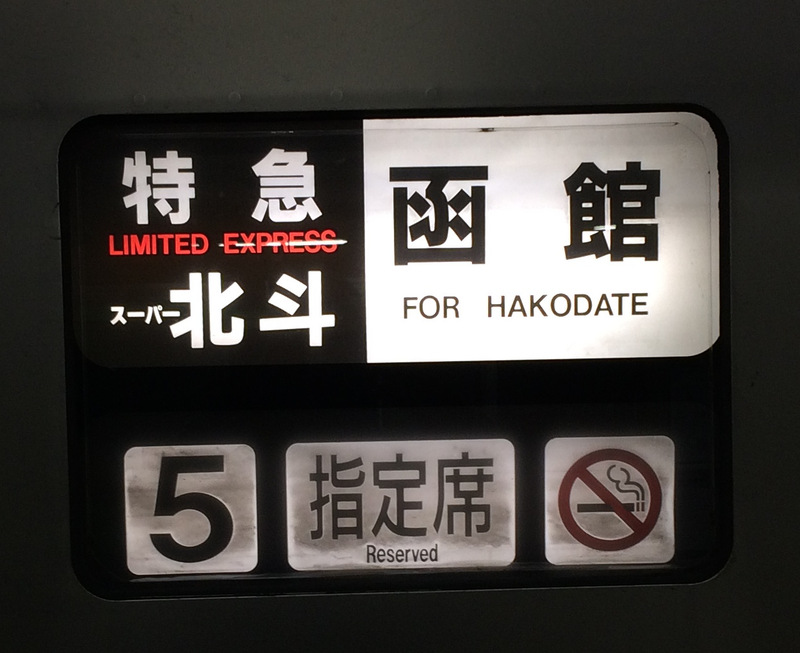 The unreserved discount return tickets of the JR Limited express train (Ltd. Exp Hokodate) from Sapporo Station to Lake Toya station cost about ¥7,230 and are valid for 6 days from the date of purchase. Lake Toya resort town is 6.0 km from the Toya Station. Most of the hotels offer a free pick up from the Toya station. We arrived earlier than our check-in time and a very polite hotel staff snubbed us saying they can only pick us up post check-in time. Another option was to spend ¥2000 by catching a taxi. But, being The Frugal Queen, I decided to take a bus that by the grace of the good Japanese lords runs once an hour and costs ¥320 for the 15-minute ride. We were famished by the time we reached Lake Toyako Onsen, so the first thing on our mind was lunch. 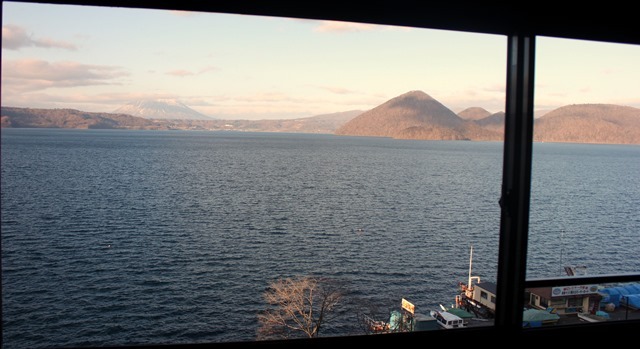 A hot bowl of Soba with Tempura and an awesome view of the lake at the restaurant Wakasaimo Honpo was just what I needed. The restaurants are not very cheap here and an average meal for two will cost around ¥2000. After lunch, we checked into our hotel and dropped the luggage. Our room was good in size with a decent bath and toilet, which looked surprisingly similar to the one we have in our apartment. After a quick rest and went out for a walk at the Nishiyama Crater Walking trails. Once, there we got to know that the trail is open only from mid-April to early November. Therefore, we went to the Volcano Science Museum. The museum gave us a true experience of the Mt. Usu’s eruptions in the past using 3D images and vibrating floor. Although, it wasn’t the blockbuster I was expecting for ¥600. We left for the hotel as it got dark and chilly and feeling exited about the onsen that awaits us. The hotel has large and segregated baths for men and women. My favorite was the open-air bath with a mesmerizing lake view under the night sky , made me feel almost tranquillized ! At 7:00 pm, our huge Japanese meal arrived in our room. 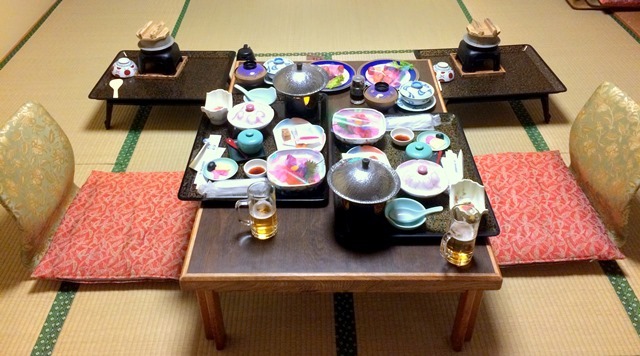 It was like a royal dinner, for people who love Japanese food of course. 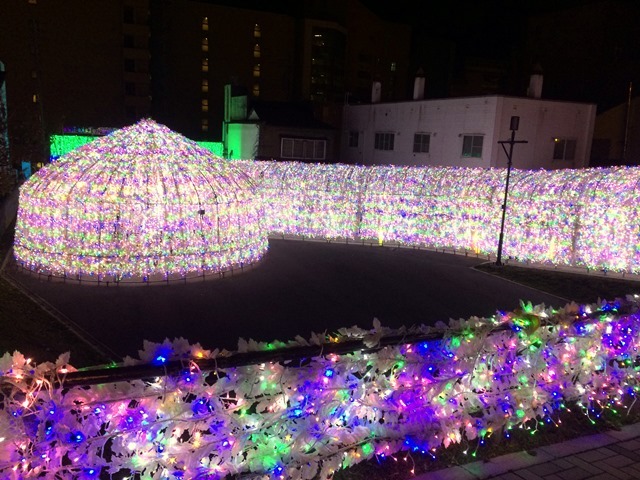 After dinner, the hotel staff made futon beds and told us about the illuminated tunnel close to our hotel. We decided to go for a walk before hitting the bed to digest the huge meal that we devoured. I woke up early the next day to watch the morning sky with the lake view. We had a buffet breakfast at the hotel that was a little disappointing. After another quick dash to the onsen, we checked out and went for walk in the Lake Toya Gurutto Chokoku Koen. 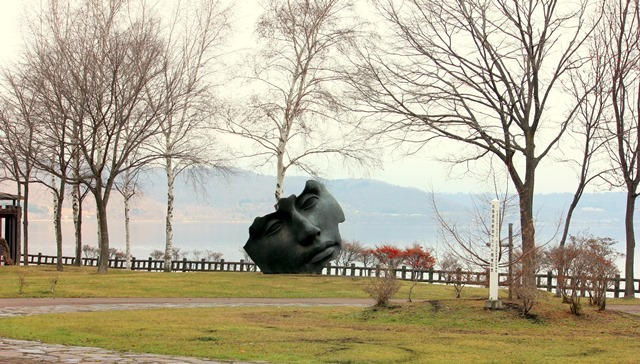 We saw some beautiful art sculptures around the serene lake. With little time in hand before catching our return bus, we went to a free hot foot-bath on the lake and bought some Omiyage’s from Wakasaimo Honpo. On our way back, we caught the bus from Toyako Onsen Bus Terminal and then the JR Limited Hakodate express train back to Sapporo. This was a relaxing one-day trip with the onsen being the center of our attraction. There is a lot more to see around Lake Toya so next time we will hire a car and drive to Lake Toya during spring and summer. 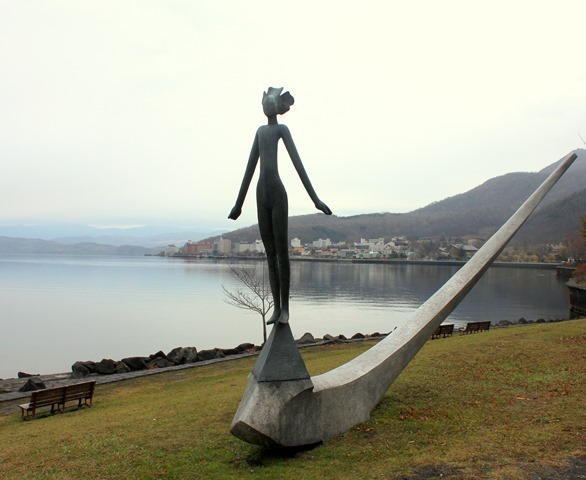 May i ask if i buy Sapporo city-Hakodate round trip, can i drop by hell valley and lake toya? While i will be overnight in Hakodate .. return the next day. Is that possible? Thank you. Unfortunately, you cannot do that on normal or discounted round trip tickets as they are for one ride only. 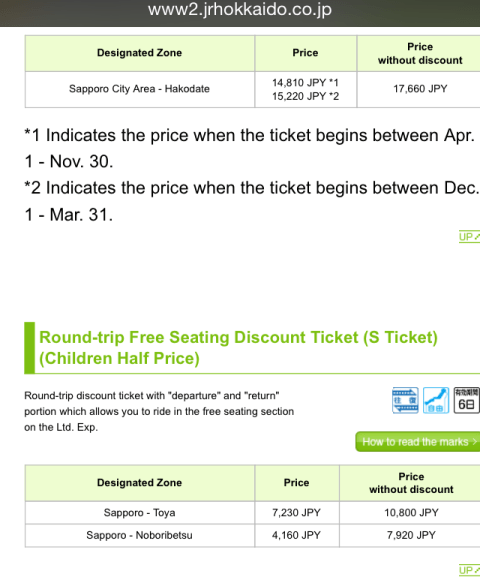 One option would be to buy a 3 day Hokkaido JR pass and use it for your. If you have spare time you can use the same ticket to visit other places too. See the link below.